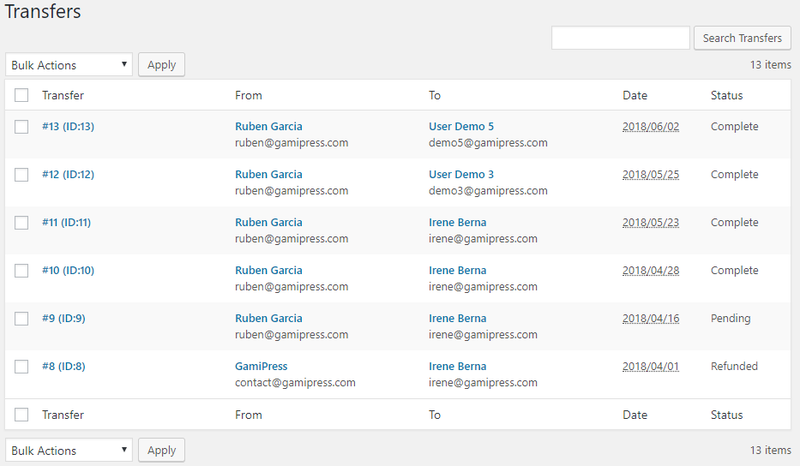 You will find the Transfer History screen on your WordPress admin area navigating to the GamiPress menu -> Transfer History submenu. 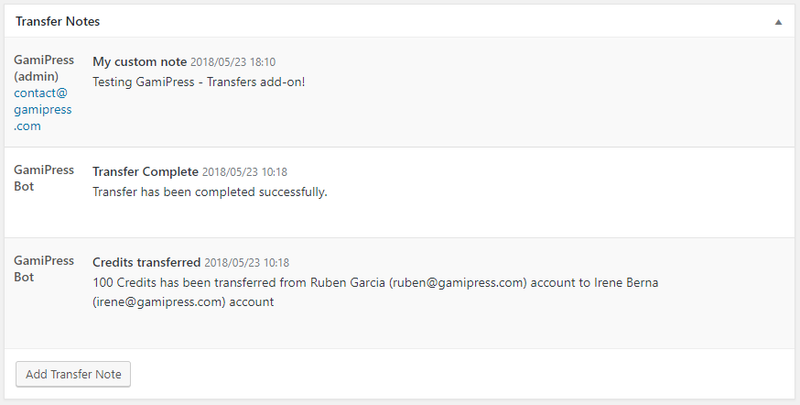 The transfer history screen is a quick view of all transfers stored by GamiPress – Transfers. Quickly you will see each transfer number, user that perform the transfer (from), recipient (to), date and status. Clicking on the Edit link, you will be redirected to the transfer edit screen. From the transfer details, you have a quick look of the transfer information like the transfer ID, which user has perform the transfer (from) and which user has receive the items (to). The transfer items are all items that user has transferred to the recipient. An important detail of each transfer item is the assignment it has and how it works, so check the next section to see how transfer items assignments works. Each transfer item can be related to an assignment. This assignments are the points type, achievement or rank that user will earn on complete the transfer. Of course, you can define transfer items without assignment to add custom lines for something, like a descriptive note to be shown inline. Let’s to see how to add an item and assign it to an achievement. As you can see, you can define a custom description, quantity, price and total. The first field is the assignment type and it could be any of our registered points types, achievement types or rank types. Choose any of your registered achievement types (in this example, the “Badge” achievement type). Now, a new field will be loaded letting you choose the “Badge” you want to assign to this transfer item. Clicking on the “Save” button will confirm our assignment. Now, the assignment description will change with the current transfer item assignment description. Important: This assignments will be awarded to the recipient when the transfer gets completed and will be revoked when transfer gets refunded. If you set new assignments when transfer is completed they will not be awarded. Add the assignments you want. Change the transfer status to pending. Save the transfer (this will trigger internal actions based on transfer status change). Change the transfer status to complete. Save the transfer (here is where internal actions based on transfer status changes from pending to complete will happen and will award everything). That’s know as transfer status transitions, and normally they happen when transfer status changes from pending to complete and from complete to refunded. To manually revoke the assignments you need to do the same but changing with the status from complete and refunded. 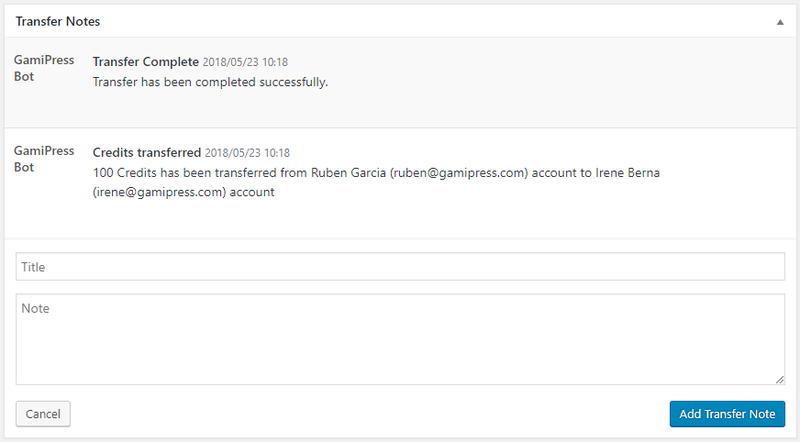 The transfer notes has two functionalities, first GamiPress – Transfers will use it to inform about internal process results like a log. When transfer fails for some reason, when transfer gets complete, etc. The author of this notes will be the GamiPress Bot. Also, you have the ability to add your own notes for internal purposes. This process is explained on the next section. Just fill the form with the title and note and click to the “Add Transfer Note” button to add it. Note: Adding transfer notes will be done and stored without refresh the page. So you do not need to save the transfer if you just added some transfer notes. 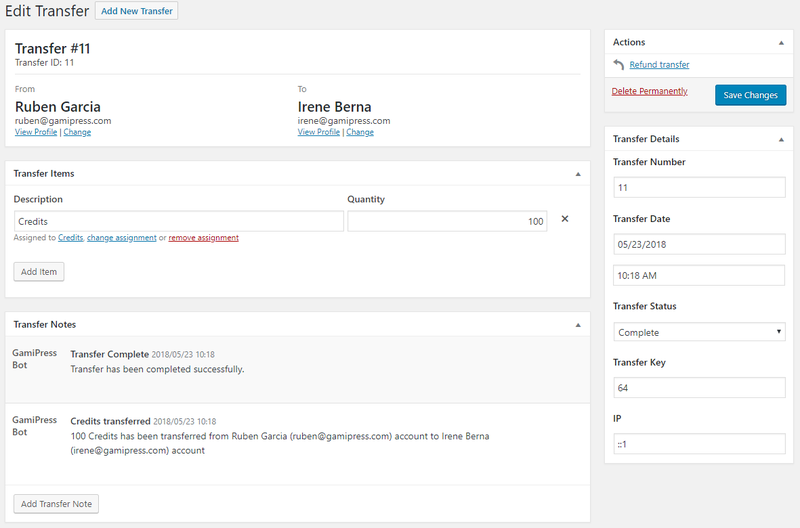 From the transfer actions box you will be able to process some actions based on the current status of the transfer. When the transfer is pending, you can mark it as complete with a simple click and items will be transferred to the recipient user. When the transfer is complete, you can refund it and transferred items will be restored.